Frankfurt Christmas market is one of the most beautiful in Hessen, and one of the oldest Christkindchesmarkets in Germany. Many German cities and towns have a marvellous backdrop of historic houses and beautiful places for their Weihnachtsmärkte. However, look at the photos, the scenery and atmosphere on the Römerberg in Frankfurt is especially enchanting. 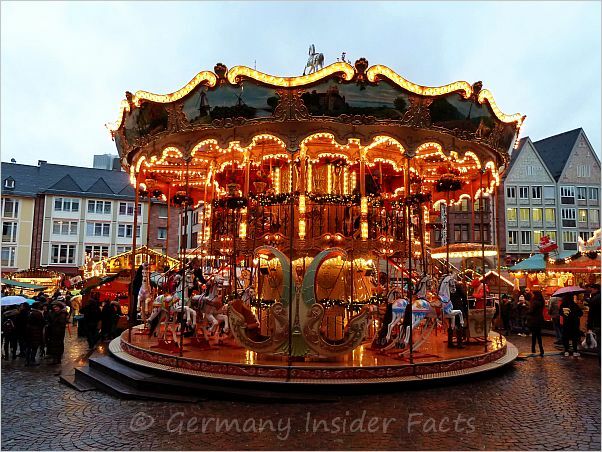 If the Frankfurt Christmas market doesn't put you into high spirits and into a special festive mood, there won't be hardly any other Christmas market in Germany to accomplish this. 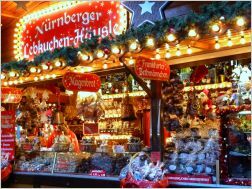 Take a stroll across the market, listen to Christmas carols and church bells, smell the aroma of roasted chestnuts and almonds, cinnamon stars, mulled wine and Feuerzangenbowle. 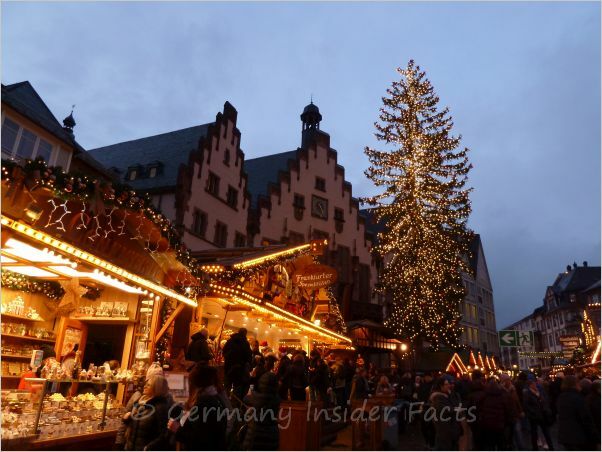 Let the charm of the Frankfurter Weihnachtsmarkt embrace you, and bring back memories of bygone days. Proof of a Weihnachtsmarkt in Frankfurt goes back as far as 1393. That is a long tradition, isn't it? Certainly, the Christmas markets at that time were by far not so big, colourful and inspirational as they are today. 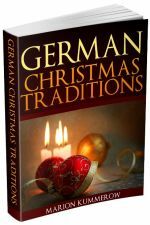 The early Christkindchensmarktets in Frankfurt were a source for the locals to purchase essential supplies before winter hit hard. The golden rule was that only citizens of Frankfurt could trade their products on the market. The custom of erecting Christmas trees started in the 19th century. At this time the Weihnachtsmarkt in Frankfurt already resembled the wonderful market of today. Small stalls offered only Christmas related articles, wooden toys, rocking horses, small carts and dolls made from cloth. It was a common tradition among parents to buy children's toys at the Christmas market. During WWII the historic houses on the Römerberg were destroyed, and the market was held at several locations in Frankfurt during the post-war period. 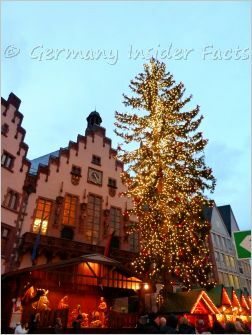 In the 1970s Frankfurt Christmas market moved back to its traditional home at the Römerberg and has been there ever since. Parts of the beautiful half-timbered houses have been rebuilt to its former glory. 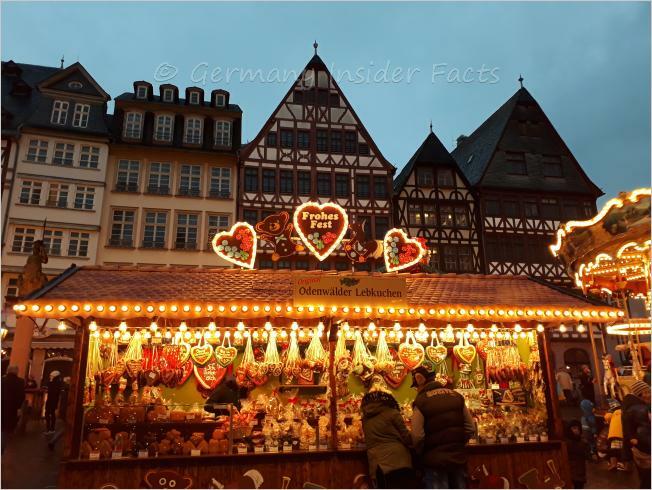 Since then the Frankfurt Christmas market has become an attraction for locals and international visitors alike. Today the Weihnachtsmarkt stretches from the Zeil shopping mall to the Römerberg and down to the river Main. More than 200 beautifully decorated stalls catch visitor's attention. The huge Christmas tree in front of the Römer is the pride of the locals. With thousands of lights the tree adds to the festive atmosphere of the market. The official opening by Frankfurt's mayor is on 26th November 2018, at 17:00, at the stage in front of the city hall. Chiming of Church Bells (Frankfurter Stadtgeläut) - Christmas and church bells belong together. Listen to the chiming of Frankfurt's 50 church bells (from 10 churches) on the Saturday before the 1. Advent, 16:30 to 17:00 and 24th December 17:00 to 17:30. Take a walk from the Römer down to the Main to get a different sound experience as you can't hear the bells of all churches at one place. Carillon (Glockenspiel) of St. Nicholas' Church - Apart from its 4 bells which are in tune with the other church bells, St. Nicholas Church also has a carillon of smaller 47 bells. Listen to the carillon daily at 09:05, 12:05 und 17:05. Frankfurt artists are featured in the Römerhallen during the Christmas market. Christmassy merry-go-rounds, toys and sweets keep the kids happy. Of course Nikolaus (Santa Claus) visits the market as well. Meet him on 6th December from 17:30 on the Römerberg stage. Traditional Frankfurt Christmas cookies, include Bethmännchen, Brenten and Quetschemännsche. 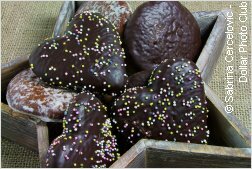 The latter are made from nuts and dried plums, while the others are made from marzipan. You can take part in a guided walk around the Christmas market, get a stunning overview from the tower of the old Nicolai church, and listen to stories about Frankfurt and famous people. 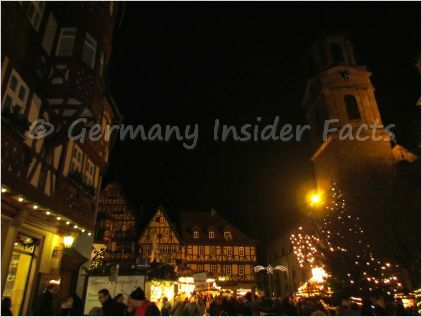 The Weihnachtsmarkt walk is held on Saturdays & Sundays (available with an English guide as well) at 11:30 and 13:30. Meeting place is the tourist information on Römerberg. The market will be open from 26th November 2018 until 22nd December, daily from 10am (Sundays 11am) to 9pm. The Frankfurt Tourism website offers a weekend package (from Friday to Sunday) which includes accommodation for one night, a Frankfurt card for 2 days, a river cruise and other extras. The price depends on the hotel you choose. Info is available later this year, or check my Frankfurt Hotel Guide to find a lovely hotel for your stay. Enjoy the Frankfurt Christmas market. Then a private guided tour is the best choice for you! A customised private tour is not as expensive as you might think. Especially multi-day tours have fairly competitive prices. Sure, your freedom to go off the beaten track is slightly more expensive than a commercial tour. But isn't your once-in-a-lifetime Christmas market tour worth an extra dollar? Fill in the form on the right to get in contact with a native German tour guide. This is one of the less-known markets, but a very pretty one! The market opens from Friday to Sunday on all four Advent weekends. Hi Rita, Just wanted to touch base again and say thank you for all of your tips and putting us in touch with Markus. We ended up hiring Markus to do Rothenburg and Nuremberg on Friday and then he took us to Freiburg, Gengenbach, Baden Baden and Speyer on Saturday. He was wonderful. He spent 12 hour days with us and there wasn't anything I asked of him that he didn't do it. We loved Germany & hope to come back again & maybe do a couple of the bigger cities. Again, thanks for your assistance and all the best, Ellen.